Have you ever thought of how fairy tales are created? Have you ever wanted to create your own fairy tales? That’s what Once Upon A Time (3rd Edition) allows you to do. Once Upon A Time is a story-telling card game meant for 2 to 6 players. The game initiates collaboration and creativity amongst players. Players would receive an ending card at the start of the game,and the objective is to steer the story towards the ending that is stated on their ending card, while getting rid of all other story cards in hand. The players come to a conclusion on who becomes the first story teller. Other players might try to steal the role of storyteller by playing a card that contains a word that the storyteller made used of in their story, or by having the current storyteller end their turn. Either of this action would cause a change in story teller and the new story teller would have to continue the story from where it was last left off. All the cards, including the ending cards, have a fairy tale theme which makes the entire storytelling family friendly. 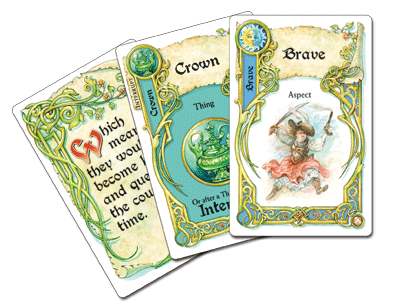 Once upon a time (3rd Edition) is a great storytelling game that can be played by a wide variety of age groups, that guarantees endless joy and fun new fairy tale creation that the player will experience when they play it.